This is getting spooky. I went to Costco a couple days ago. I got home and got a message from Google telling me to "rate my visit to Costco". It knew my phone had been there. Yesterday I bought a garbage disposal from Home Depot. I looked at Facebook last night and, gee, whadda ya know, I got an in-feed Home Depot ad for the exact garbage disposal I'd bought. I'm not very likely to buy a second garbage disposal, so it was misguided, but still. Facebook's targeting had said "Hey, we have an ad spot for John Q. Public at 1234 Elm St. Who wants it?" and HD won the bid. Facebook said it was me, HD said "I bet he wants another garbage disposal for the bathroom." I'm not a real paranoid individual and this is the future we were sort of looking forward to where we would get advertising for businesses we're actually likely to buy from but it's a little disconcerting now that it's here. That "Date Muslim women" site isn't putting up the money to target their ads, but some are and boy, they're pretty accurate. But the good news on that, as someone who's especially concerned about the demise of newspapers, is that ads like that probably pay well. Maybe more if I'd clicked it. Maybe it's a sign that digital ads might finally start paying rates that are comparable with print. Yes, I'm very concerned about where my data can go and I'm concerned that Facebook got so fast and loose with it and that so many of us have been fooled into giving up personal information to people hiding behind innocuous clickbait sites, but in other ways I don't really mind it. But I'm just an ordinary guy with no secret life and I don't think I have that much for the Deep State to be especially interested in. Your results may vary. Getting a message from Google asking me to rate my visit to a strip joint might cause some concern, though. So did anybody get the notice from Facebook about their data being scraped? They said they were going to put it in people's feeds yesterday but I haven't seen one. I'm surprised, considering it could have happened because of something I did or something a friend might have done and because of the reach. They said 87 million people could have been affected. Did it miss me or have I just not gotten it yet? Maybe Trump was right all along. Maybe there's no overestimating the stupidity of most people. How dumb do billions of people have to be to post the most intimate details of their thoughts and lives on the largest public platform in human history, and not think that somebody would come along and mine all that information for their own gain? It's especially funny to me since sites like this one wouldn't exist if we required so much as a real name - much less where you live, what school you went to, where you work, pictures of your family, records of everything you do, etc. I'm still not all that concerned about the info FB might have about me as long as they don't find out about my second job as a drag dancer at a lesbian bar or my criminal record as long as your arm, but I am concerned that people were duped into giving that information up to third parties by sites that didn't disclose that and that their information was disclosed without their even being a party to it. And that it might have been turned around and used to take advantage of them and dupe them all over again. And another note on this site's privacy - I had an option to install a plug-in that would let people register using their FB and Twitter profiles but I opted against it when I looked at what information it required from me and at how people's connection to this site might impact their privacy elsewhere. After all these years, I never knew you were a Servite alum. ...but I am concerned that people were duped into giving that information up to third parties by sites that didn't disclose that and that their information was disclosed without their even being a party to it. I don't understand why. If I run my dirty underwear up a flagpole, what's the difference if the flagpole owner sells it to a third party, of if the third party steals it in the middle of the night? The idiot in either scenario is still me. The rule of thumb seems simple -- don't put anything on social media that you don't want the whole world to know and possibly take advantage of. I actually knew a guy who was a drag dancer at a lesbian bar, but he lived closer to Amat. Private schools have no attendance boundaries, so he could have gone to Servite. Ha! I gotta laugh at the sign in the middle. Right up there with that "Death to all Juice" guy. 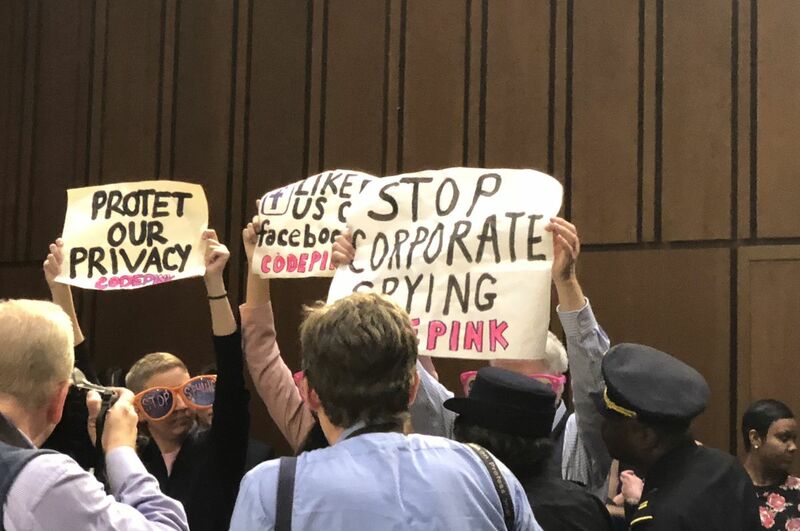 From outside Zuckerberg's testimony today. You can check for yourself on this Facebook help page. You'll either get the above message or one that says you or a friend did it. If a friend did it, your public profile, page likes, birthday and current city were shared. If you clicked it, add your News Feed, timeline, posts and messages. It doesn't tell you what's been shared with other people but it will give you a clue as to what might have been shared. If you haven't reviewed your settings you should, including the "Apps and websites" section. And in case anyone is wondering, this site's "share" buttons go directly to those sites and not through a third party, like some do.